P.S : I Fix Nada, Noble Sry..
What is the meaning of the person/persons in orange text? Are they the coach or can they play as well? In order of strength I rank the teams: 8, 1, 3, 2, 4, 7, 6, 5. Arguable for 5 ahead of 6 in the last 2 spots. Should be really fun to watch this Korea lifeblood was always the teamleague and winners league format imo. What is the meaning of the person/persons in orange text? Are they the coach or can they play as well? Let's go ex-SKT players! Even though you're on different teams you'll always be in my heart. You are on the same team as ggaemo. That's a victory in itself. Matches its live afreeca.tv studio? well its pretty obvious which team I'm rooting for. 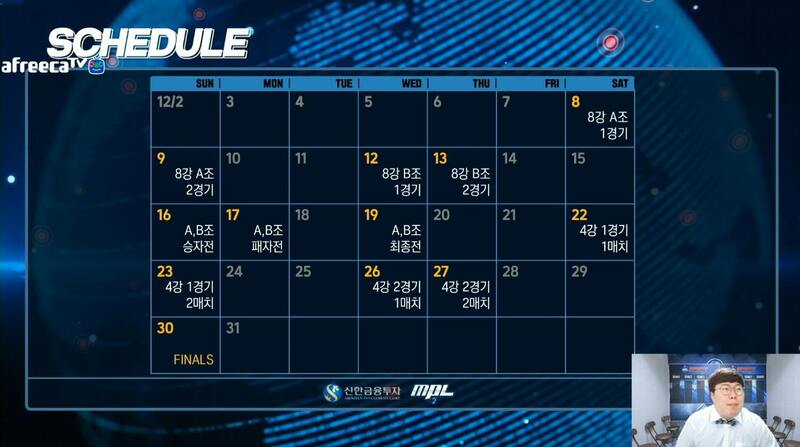 only the finals, the rest is going to be played online, but maybe with more support that might change next season. pretty sure MPL has been planned all the way to season 5 right now. This should be fun and fill in the BW void while the ASL is between seasons and the KSL is almost over. my teams sponsor is seliver shoes, everyone should go out and buy 10 pairs each to support my team, if you dont do it youre killing esports. And Larva! And Horang2! This is the best team ever! BROODWAR STRONGER THAN EVER !!!!!!!!!!!!!!!!!!!!!!!!!!!!!! Rainbow's choices would make sense if it were 5/3, as you have a one win card in Last, and by picking weaker players you get another one win card in Cadenzie. But in a 7/4? I don't know what he was thinking. Personally, I think Gamst's K League has the highest odds of winning. Go Reach! Connects Zero Term (Nal_ra): seems to be a company that helps with important tests, specifically TOEIC. Seliver Shoes (Rainbow): obviously sells shoes. PicUP (Firebathero): honestly I don't get economics at all, but looks like a brand-influencer marketing platform with reaches in popular SNS platforms. Isoi Perfect Man (Zeus): beauty products. According to Zeus, his wife uses products from this company. Nol Kkot (Iris): an app that compares places to drink, eat, and generally engage in hedonism. Available on Google Play also. 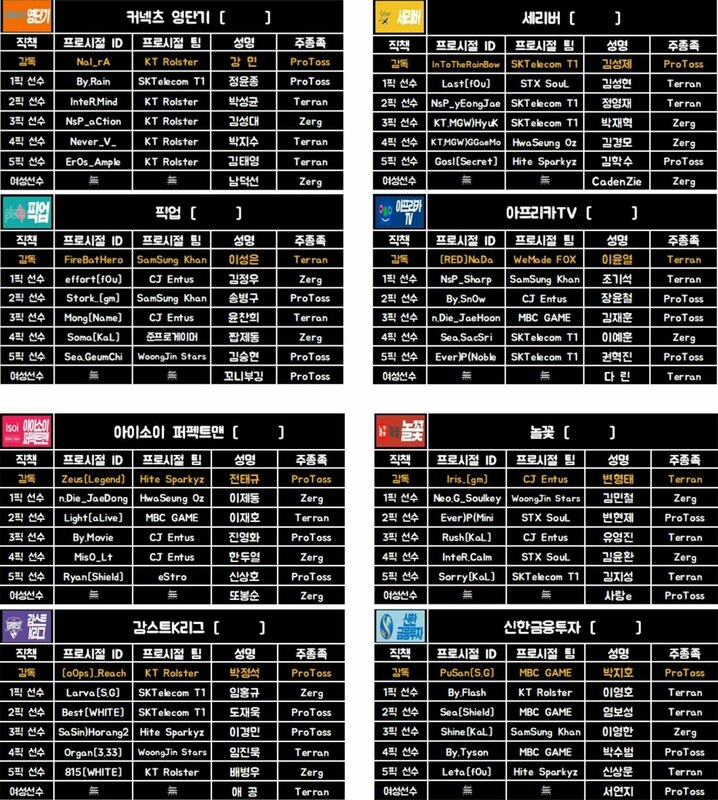 Gamst K League (Reach): Gamst is a popular streamer ("World Class") who does variety and soccer. He also has a great deal of passion for BW, and sometimes competes against Animal Tier female streamers. Shinhan Invest (Pusan): a Korean bank, and also sponsored the tournament aside from just a team. Too bad Soulkey, Piano, Guemchi aren't on the same team (they have self-formed that way several times) Never seemed unbalanced, yet they've played well together.